Reno, Nevada -- Glenn “The Filipino Bomber” Donaire was immediately brought to the nearby St. Mary’s Hospital after completing routine post-fight physical examinations at the dressing room of the Silver Legacy Casino Resort in this City. 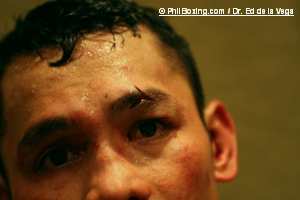 Donaire need stitches to close his facial cuts. Part of the test conducted by the physician from the Nevada State Athletic Commission was the gathering of a urine sample. What was odd however, was the fact that it was only done on the winning fighter, in this case, Donaire. Donaire was involved in an 8-round rough and tumble fight against a slugger from Para, Brazil, named Jose Albuquerque. Albuquerque appeared to have thrown the whole thing against Donaire, except the proverbial kitchen sink. He pushed, he hit on breaks, he used his elbow and he was also guilty of a head butts making the fight really bloody. Albuquerque himself suffered a scalp wound that bled from round three. In the end, Donaire had two cuts on his left side. One of the upper eyelids that needed two stitches and one on the brow, a “Y” shaped cut that needed four stitches to close. But he won the via a unanimous decision bringing him a step closer to another title fight in the very near future.